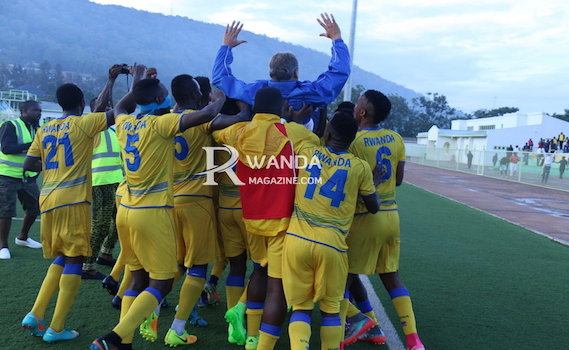 The senior men national football team of Rwanda, Amavubi has qualified for the Total African Nations’ Championship tournament due to take place in Morocco from January 12 to February 4, 2018. Amavubi got a ticket to CHAN 2018 after eliminating Ethiopia’s Walia on a 3-2 score aggregate after securing a 3-2 win in Ethiopia on November 5, 2017 and a goalless draw for the return leg on Sunday, November 12, at Kigali Regional Stadium in Nyamirambo. The playoff game followed Egypt’s withdraw from the tournament. Amavubi walked on the field frantically having in mind a 3-2 win over Ethiopia in Addis. For Ethiopia to win a ticket to Morocco, they had to beat Amavubi on a 2-0-goal difference. Needing not to concede a goal, Rwanda’s coach Antoine Hey’s tactics were to play a defensive game. He assembled eight players, all of whom are spontaneous defenders. Ethiopia dominated the starting 10 minutes of the game, but couldn’t get a goal from Eric Ndayishimiye Bakame. Rwandan strikers Abedy Biramahire and Justin Mico couldn’t convert the ball into the net from crosses mostly kicked by Radou Iradukunda. In the 23th minute, Rwandan narrowly secured a penalty when an Ethiopian defender in the penalty area brought down Justin Mico, but the referee called it off. Rwanda got a free kick in the 25th minute that was taken by Eric Rutanga, to be saved by Ethiopian goalie. Justin Mico maintained thirst to score a goal, at one point he sent a missile over the crossbar. Getan Kebede missed a goal in the 28th minute for Ethiopia who hardly got close in front of Amavubi’s net. The first half ended without any net shaken. The referee blew the halftime whistle with a 0-0 goal. In the second half, Rwanda continued to defend. German coach Antoine Hey made some changes, bringing in Muhadjir Hakizimana off the bench to replace Rayon Sports’ Djabel Manishimwe. In the 68th minute Justin Mico sent a thunderbolt shot only to be saved by Ethiopia’s goalkeeper giving Rwanda corner kick. Rwanda’s Maxime Sekamana later replaced Abedy Biramahire while midfielder Ali Niyonzima went on to the field in the substitution of Justin Mico in the four additional minutes. The game ended with securing a clean qualification to the CHAN games for the third time after having participated in 2014 hosted by Sudan and in 2016 hosted by Rwanda. The draw for CHAN 2018 games will be held on November 17, 2017 in Morocco.